Do You Know Everything You Should About Spare Tires? Your car should come with a spare tire, just in case you ever end up with a flat. While you can contact professional services to put the spare on for you, it is beneficial if you know how to do this task yourself. It will come in handy if you ever find yourself on the side of the road, and you will not have to wait around for a mechanic to show up. First, it is important to know what type of spare tire you have for your vehicle. There are two types available: full-size and compact. A full-size is essentially another tire for your vehicle that you can leave on. It serves as a permanent fix. Compact spares are more common, and they are only meant to be temporary. If your car has one of these, you will need to go to a mechanic shortly after getting a flat so that the spare can be removed and a permanent tire can be installed. Since a compact spare tire is not a lasting solution, you need to be mindful of a few things while you are driving. First, you should not drive over 50 miles per hour on a spare. Avoid the freeway if you can. If you got the flat on the freeway, you want to stick to 50 mph until you can get off. Remain in the far right lane so that other cars can pass you. Generally, you can only travel for about 50 miles on a spare. If you drive any further, then there is a substantial risk the spare will blow out, and you will need to get a new spare as well as a new permanent tire. For a more accurate recommendation on how long you should drive on a particular model of spare, you should read your vehicle’s manual. A flashlight is useful to keep in your car as well in case your vehicle breaks down in the middle of the night. A rain poncho will come in handy if it is raining outside. Gloves are also beneficial to protect your hands. First, turn on your hazard lights and safely pull off to the side of the road. Once you are stopped, apply the parking brake so your car cannot move. Put the wheel wedge in front of your front tires if the flat is in one of your back tires, or in front of the rear tires if the flat is in the front. 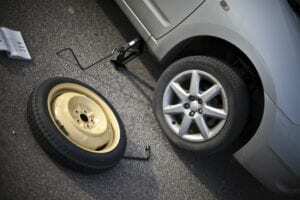 Remove the hubcap and loosen the lug nuts from the tire with the lug wrench. Place the jack under your vehicle, and lift it up. You can keep the jack balanced by setting it on top of the piece of wood. Once the vehicle is raised, you can remove the lug nuts completely. After that, you will be able to remove the tire. Next, mount the spare, and reapply the lug nuts. Make sure they are all tightened as much as can be. Lower the vehicle, put the hubcap back on and put all the equipment back in your car. When all is said and done, it should only take between 15 and 30 minutes to put on a spare. Knowing how to handle the problem yourself allows you to get back to driving much faster than if you had to wait for someone to replace your tire for you.